5 stars - "Epson Stylus SX410 All-in-one InkJet Printer with CISS" by Mia	, Written on 2012, 17:51/07/09 Why not to make different panels for a printer? It's great, but I'd like it also can be stylish: pink today, silver tomorrow. 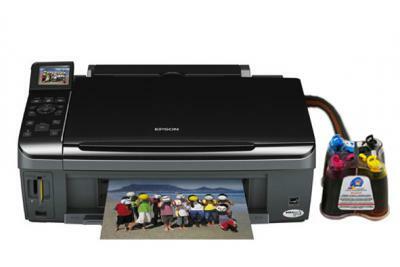 Buy Printer Epson Stylus SX410 with CISS and make 30 times more quality prints for the same money! * Print permanence ratings are based on accelerated testing of prints on specialty media, displayed indoors under glass or UV filter or stored in archival sleeves in album storage. Actual print stability will vary according to media, printed image, display conditions, light intensity, humidity, and atmospheric conditions. Epson does not guarantee longevity of prints. For maximum print life, display all prints under glass or UV filter or properly store them. Why not to make different panels for a printer? It's great, but I'd like it also can be stylish: pink today, silver tomorrow.